Western blotting: Cell Lysis - Advansta Inc. Efficient cell lysis is an important step in preparing quality samples for Western blot analysis. Inefficient lysis can result in incomplete isolation and recovery of proteins, decreasing the ability to detect the protein of interest. Sample degradation can also occur, resulting in loss of protein integrity. The method chosen for lysing cells is dependent on the type of sample and the composition of the cell. Plants, bacteria, fungi, algae and archaea all contain cell walls that provide resistance to lysis. Mechanical methods (physical disruption) are often required to disrupt the complex cell wall matrix. Mammalian cells are bounded by plasma membranes, protein rich lipid bilayers that are easily disrupted. Frequently, cultured cells can be ruptured using detergent buffer without mechanical methods. This guide focuses on different methods of lysing cells, including physical disruption methods and detergent lysis, as well as tips for recovering intact proteins. Physical methods have traditionally been used to lyse cells. Physical disruption is popular because it can be used with a wide variety of source material; applied force or duration of treatment can be adjusted to accommodate different materials. Physical methods have several disadvantages. Physical forces can create local heat spots in samples leading to denaturation and aggregation of proteins. Reproducibility between experiments can be difficult as it is challenging to define the amount of force generated by a particular experimenter. This is particularly true with homogenization and grinding. Likewise, individual differences between equipment can also contribute to a lack of reproducibility between laboratories. Physical disruption methods include mechanical disruption, liquid homogenization, sonication, freeze/thaw cycles and grinding. Cells can be mechanically disrupted using rotating blades that disrupt and tear samples. Common instruments such as a blender (Waring) and the Polytron homogenizer, are useful in extracting proteins from large amounts of complex mammalian tissue and in disrupting large volumes of yeast samples. While blenders are preferred for larger sample sizes, the Polytron can accommodate samples ranging form 0.1mL to 10 L depending on the model. A simple and inexpensive method for the disruption of small volumes of yeast and bacteria is to suspend glass beads within the sample and vortex the sample repeatedly. The beads disrupt cell membranes through shear forces, grinding between the beads and collision with the beads. Vortexing with beads is not at powerful as other physical method and may not disrupt samples completely. For larger volumes and more efficient disruption using beads, specialized instruments (e.g. a bead mill) can be used to “shake” the container of sample and beads. 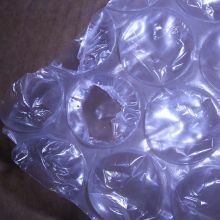 The density, quantity and diameter of the beads can be adjusted to increase or decrease cell disruption. This method is ideally suited to lysing large sample volumes. Beads can be used to lyse bacteria, yeast, algae, hyphae and plant and animal tissue. To avoid heat, samples and containers should be pre-chilled and multiple short cycles with chilling in between cycles should be used. Alternatively, fewer beads can be used and the vigor of the shaking can be adjusted. Liquid homogenization is the most popular method used for small volumes and cultured cells. Cell walls are disrupted by shearing forces when the samples are pushed through a small space. Three different types of homogenizers are commonly used. Dounce homogenizers are inexpensive glass pestles that are manually driven into a glass tube. They work most efficiently at mildly lysing single cell suspensions. Homogenizers of different sizes can be purchased to accommodate a variety of volumes. They are easy to use, clean and decontaminate. Processing with Dounce homogenizers can be time consuming and do not work well for high throughput sample preparation. The Potter-Elvehjem homogenizer is a polytetrafluoroethylene (PTFE) pestle that is either manually or mechanically driven into a rounded or conical vessel. This homogenizer is good at disrupting cells but not tissue. Similar to the Dounce homogenizer, it is easy to clean and use. Although relatively inexpensive, mechanically driven pestles can be costly. A French press consists of a piston that is used to apply high pressure to a sample forcing the sample through a small hole in the press. While more expensive than Dounce or Potter-Elvehjem homogenizers, the French press provides more consistent homogenization as the high pressure results in efficient lysis in two passes. The French press is often the instrument of choice when lysing bacterial cells mechanically. Samples must be in a liquid form prior to homogenization. Sample sizes are limited and throughput is low. Homogenization is susceptible to local heating. To prevent heating of samples, all instruments that come in contact with the sample should be pre-chilled and homogenization should be performed on ice, when possible. Samples can also be chilled in between strokes to prevent denaturation of proteins. The number of strokes and speed with which the homogenization is performed affects cell lysis and can cause irreproducibility between experiments. Multiple freeze/thaw cycles can be used to lyse bacterial and mammalian cells. Samples are quickly frozen using a dry ice/ethanol bath or freezer and subsequently thawed at room temperature or 37°C. Cycles of freezing and thawing causes cells to swell and break open as ice crystals form and contract. The freeze/thaw process can be time-consuming as cells usually require multiple freeze/thaw cycles for efficient lysis. Grinding is an inexpensive, common method for breaking down plant cells, fungi, bacteria or mammalian cell pellets. A standard mortar and pestle is used to grind cells in the presence of liquid nitrogen, which keeps cells cool and makes the cell structures brittle and easy to grind. Grinding can be dangerous due to the generation of aerosols the difficulty with cleaning the mortar and pestle. Sample recovery can be low due to loss of material in the mortar. Grinding is is labor intensive and the number of samples that can be processed at one time is limited. Several additives can be used to promote the break down of cellular structures during physical disruption of samples. Cells can be suspended in a hypotonic buffer prior to mechanical treatment. The buffer will cause the cells to swell and promote disruption when physical methods are employed. Lysozyme (200 μg/mL) can be added to digest bacterial and yeast cell wall components. The release of nucleic acids upon disruption of cellular structures increases the viscosity of the samples. DNase (25-50 μg/mL) and RNase (50 μg/mL) can be added to reduce the viscosity. Detergent-based lysis is a popular method for disrupting cells and has several advantages over physical disruption. Detergent-based methods are efficient and easy to use and do not require special equipment. 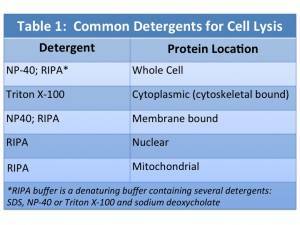 Various detergents can be employed to disrupt different cellular structures, aiding in isolation of protein fractions. Detergent choice depends in part on the location of the protein of interest within the cell, whether protein:protein interactions are being studied and the effect the detergent has on the protein. The chemical structure of detergents enables them to disrupt membranes and solubilize proteins. Detergents have both a polar and nonpolar portion, and can be classified by the characteristics of the polar group: ionic if the polar group is positive or negatively charged, nonionic if it is uncharged, or zwitterionic if it contains positive and negative charges with a net charge of zero. Detergents can be classified based on their polar group and/or their ability to denature proteins. Table 1 includes a list of common detergents, their characteristics and their uses. Ionic detergents (anionic or cationic) are considered “harsh” detergents because they alter protein structure to a greater extent than nonionic detergents. Denaturing detergents completely disrupt cellular structures and denature proteins by breaking protein:protein interactions. The degree of denaturation depends on the particular detergent and its interaction with individual proteins. Sodium dodecyl sulfate (SDS) and sodium deoxycholate are two commonly used ionic detergents. While they efficiently disrupt all cellular structures, denaturing detergents have disadvantages. Because they disrupt protein:protein interactions, they cannot be used for coimmunoprecipitation of proteins. Denaturing detergents cause release of nucleic acids and the lysis solution can became viscous making pipetting difficult. As mentioned for physical disruption methods, nucleases can be added to reduce viscosity. Alternatively, lysed cells can be passed through a small bore needle to shear genomic DNA. Nonionic detergents are considered “mild” detergents. They are known for their ability to disrupt lipid:lipid and lipid:protein interactions, but not protein:protein interactions. They are much less efficient at denaturing proteins and allow proteins to retain their native structures. Common nonionic detergents are Tween-20, Triton X-100 and Nonidet P40. Non-denaturing detergents can be used to investigate protein:protein interactions and study biologically active proteins. They are often used for extraction of membrane proteins. Zwitterionic detergents have characteristics of both ionic and nonionic detergents. Similar to the milder noninonic detergents, they are less denaturing, yet they are more efficient at breaking protein:protein interactions. CHAPS (3- [(3-cholamidopropyl)dimethylammonio] -1-propanesulfonate) is a good example of a zwitterionic detergent and is especially useful for solubilizing membrane proteins. Disruption of cellular membranes, either through physical means or by detergent solubilization releases active proteases that can degrade proteins of interest. Several steps can be taken to prevent protein degradation. Samples should be kept as cool as possible during the lysis process. Precool all glassware, plasticware, instruments and buffers that come in contact with the sample. Use numerous short cycles when physically disrupting cells. Keep samples on ice whenever possible. Work in a cold room if samples cannot be kept on ice. Work quickly and efficiently. If samples cannot be immediately processed, flash-freeze them. Otherwise, process and use or freeze the samples immediately. Avoid repeated freeze/thawing of samples. Aliquot samples into multiple small tubes prior to freezing. Store samples at -80°C, not -20°C. Protease inhibitors are compounds that inhibit protein degradation by either reversibly or irreversibly binding to proteases. 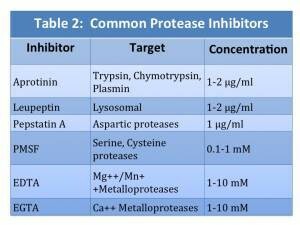 No single protease inhibitor is effective in inhibiting all proteases. A mixture or “cocktail” of several protease inhibitors is used in lysis buffers to prevent protein degradation. Protease inhibitors can be purchased individually or as a pre-made cocktail. Common protease inhibitors and their targets are shown in Table 2.